Lori and I were standing in the yard chatting while the kids hammered on their wood projects and toddler Immy rolled around in a big plastic Smart Car-looking toy she found on the patio. We talked of the difficulty of growing vegetables in Topanga Canyon, as I admired her tall, barren tomato plants. I knew something to do with them! I told Lori I would get her the recipe, went home to begin a blog post about green tomatoes, and promptly forgot all about all of it. Fast forward to now, the beginning of tomato season, critters once again knocking green tomatoes off my plants, and I remembered! Digging around the archived drafts, I found the original sketches for the post and decided to finish what I’d started. A vegetarian friend was bringing his new girlfriend to dinner, I would make my first green tomato pasta of the season, and unaware of whether or not Lori was even growing tomatoes this year, would share the green nugget of wisdom with her and the world. What you are essentially making is a pesto, albeit a lighter, fresher version bulked up with the addition of green tomatoes. The original Batali recipe calls for mint, basil, parsley and arugula. In another official version I found online, he had swapped out dill for the parsley. You can essentially create your own version of this — for example, I like to use one of my favorite herbs, tarragon, to add a grassy licorice note, and a sprig of rosemary for excitement, as well as come crushed red pepper to spice it up a bit and a couple zucchini blossoms for color. 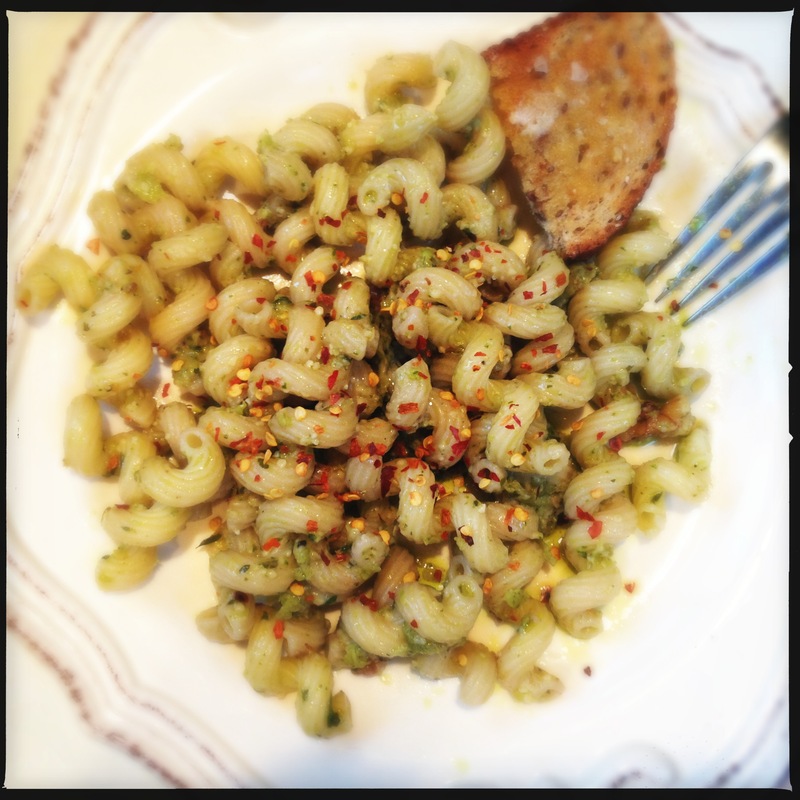 I also like using pasta other than spaghetti — the fun, curly cavatappi, in this case. 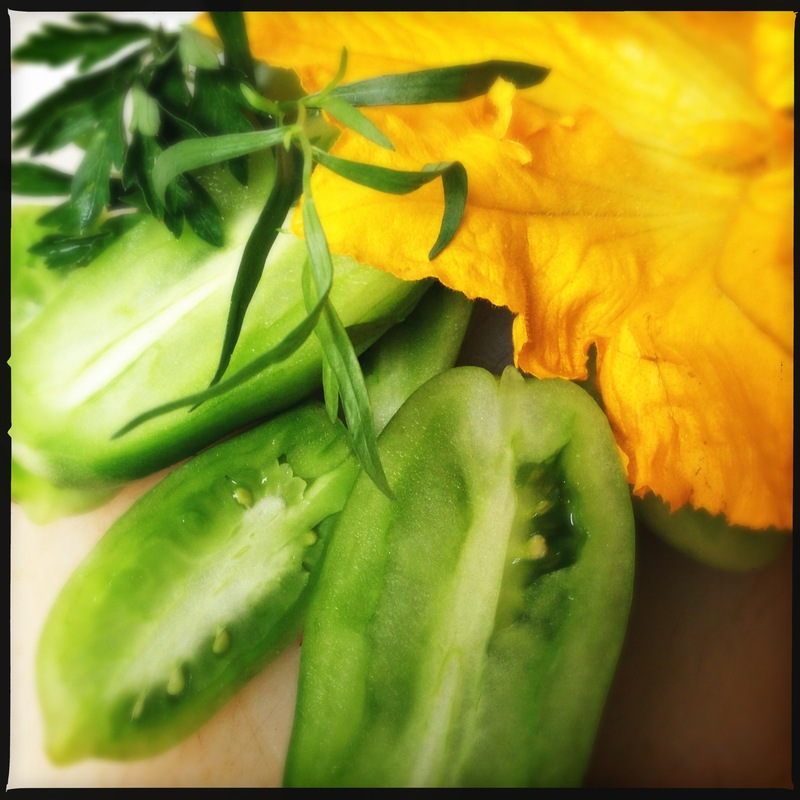 So six months late and without further ado… here, Lori, is what to do with your green tomatoes. Enjoy! Heat water to a boil in a large pot to cook the cavatappi (or whatever pasta you are using). While your pasta is cooking, place green tomatoes, herbs and olive oil in a food processor and puree until smooth but still a little chunky. When pasta reaches al dente, place green tomato sauce in a large pan over high heat. With a large sieve or slotted spoon, scoop noodles from pasta water directly into pan with sauce. Toss or stir for one minute until pasta is coated with sauce. Remove from heat, toss in parmesan, zucchini flowers (if using) and crushed red pepper, season to taste with salt and serve. YUM! I’ve managed to kill my tomato plants, so I’ll be buying my tomatoes red and ripe, but this looks so refreshing and light. I’ll have to bug my friend John, who has a zillion tomato plants, for some green ones. You’re gonna luv it, Rach. Pasta is a good idea. Pickles are good, too!